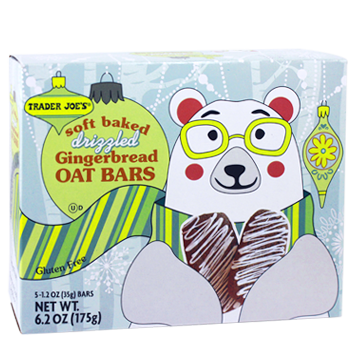 Has anyone tried Trader Joe’s gluten-free Soft Baked Drizzled Gingerbread Oat Bars? Holy crap, they are amazing!! The first time I tried them, I ate two in a row – they are THAT good. Soft gingerbread cookies are one of my favorite holiday treats, and that’s exactly how these bars taste! They were developed just for us, using a recipe that includes almond butter, whole grain oat flour, flax seeds, molasses, brown rice syrup, and fig paste, along with both ground ginger and candied ginger, as well as variety of spices and seasonings that really amp up the flavor profile. Note: I have not been compensated for this review, and all opinions expressed are truly my own. It’s nice, isn’t it, when we find something gluten free that actually tastes good!